Match day! Arsenal played Swansea at Swansea. Because England’s daylight savings time ended a week before ours in the U.S., the match was on TV at the very civilized hour of 10 a.m. in the Chicago area. I had time to sleep in, dress, and walk to the park and back in the rain while my steel-cut oatmeal cooked, eat, and make coffee, all without missing any of the match. I even saw a little of the Chelsea/Liverpool match before my walk. The 10 minutes I saw at the beginning of the second half was enough of a bumble bowl that I didn’t mind missing it. Liverpool apparently pulled together a decent match in the end that couldn’t have been predicted in those 10 minutes. Today’s first half for Swansea v. Arsenal was somewhat of a slog. In my opinion, neither Arsenal nor Swansea looked great. My opinion contrasts somewhat with the opinion of the USA network commentators who behaved as if Swansea were really doing the business in the first half. And, having now read many a match report, my opinion apparently contrasts with almost everyone who wrote up or commentated on the game. A classic case of the soft bigotry of low expectations. In my opinion. In any case, we can all agree that Arsenal came out in the second half and scored 3 unanswered goals. 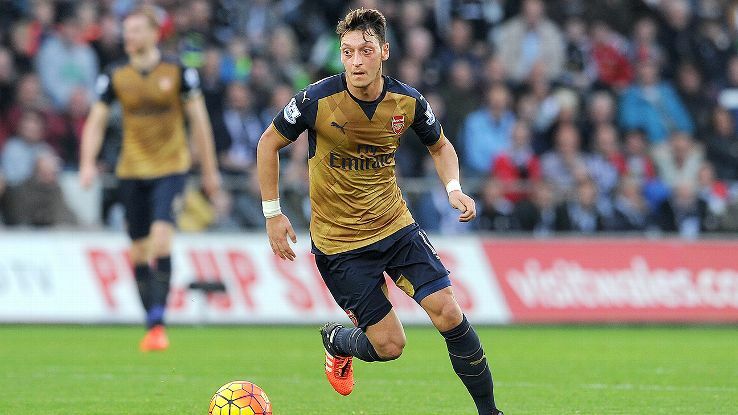 Mesut Ozil had a massive game, assisting two of the goals. Olivier Giroud started the game due to Theo Walcott’s mid-week injury and overcame a first-half knock to the knee to score the first goal, eluding the defenders on a corner kick by Ozil. To prove the ridiculousness of the level and kind of statistics kept, that goal was supposedly the 2,000th goal scored by Arsenal while Arsene Wenger has been manager. The second goal was scored by Arsenal defender Laurent Koscielny after Swansea’s keeper, Fabianski, made a hash of catching a deflected ball. The last goal was scored by Joel Campbell, who started for Arsenal for the first time in the Premier League, thanks to Oxlade-Chamberlain’s injury earlier this week and Aaron Ramsey’s injury against Bayern Munich last week. He was a bit scary at first, but grew into the game. There is probably very little danger of him keeping the starting position after Ramsey or the Ox returns, but it was good to see him have a reason to celebrate. Mesut Ozil now has nine assists for the season, leading the league, and a phenomenal record of creating chances on goal. He was man of the match for nearly every outlet that covered the game, a rare consensus in a consensus-free world. Manchester City also won today, so Arsenal and Man City are still level on points at the top of the league, with Man City in first place on superior goal differential. Arsenal closed that gap a little today. Manchester United only tied and West Ham lost, so a crack was opened between the leaders and the rest of the top teams. Gary Monk, manager of Swansea, stated in his post-match comments that the result “flattered” Arsenal; i.e., the game was closer than the score would suggest. It would be hard to argue with that, but it could also be argued that it wouldn’t have surprised for Arsenal to score another goal or two before it was over. In any case, it is Halloween today, and on Halloween it is our family tradition to have chili for dinner. When the kids were small enough to trick-or-treat and I was at the door frequently to distribute candy, that was an easy and flexible thing to have on the stove until they came home exhausted and hungry. Although I acknowledge that chili is not a dish of Chile, I might have lazily passed it off as such were Alexis Sanchez to be the celebrant of today’s Gooner Triumphal Feast. Alexis did not play very well today, foiling my plan. Because Ozil, a German, was the clear man of the match, I concluded that we must indeed celebrate him. But there would be cheating. There would be no recipe finding and shopping and special cooking. Instead there would be a visit to Trader Joes for whatever German item might be selected. I was hoping for a German dessert to land effortlessly in my cart. Unfortunately, I was faced at Trader Joes with a reality that German food is just not au courant. Italian, French, Indian, Danish, Belgian–any of these would have afforded plentiful options. But German food available was limited to bratwurst and potato pancakes. 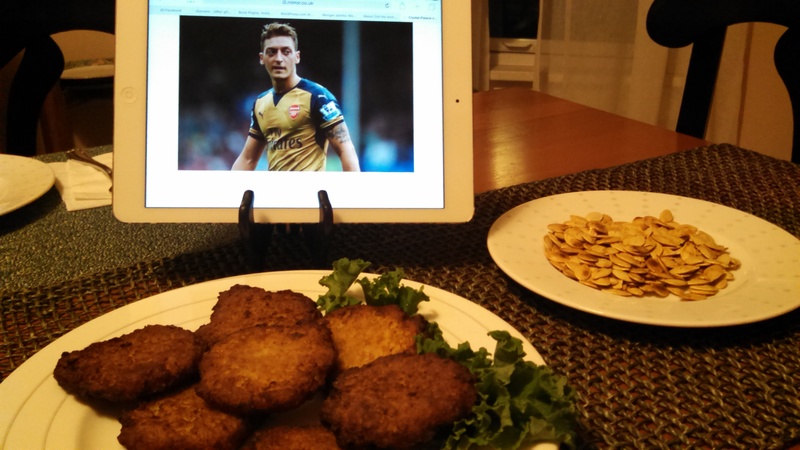 Ozil looks disdainfully at the frozen potato pancakes. I felt guilty, but I put the frozen potato pancakes in my cart. I sensed a judgment by the clerk in the check-out line when they crossed the scanner. I cooked them up along with the chili and we celebrated a scoreline that flattered with a Gooner Triumphal Feast that flattered. Mesut Ozil, I owe you a seriously Triumphal Feast. Ozil’s distain pic made me laugh out loud. The Swans can say what they will but on the “street” we just point and say “scoreboard.” Gunners ruled the day. Would like to know what you think of my Premier League power rankings I debuted on my site last week (before today’s matches). Love your site and enjoy looking forward to each new post.